Castor oil is the hottest new natural beauty trend you might not have heard of… yet. Hair conditioning treatments with castor oil are finally getting attention on social media, but using castor oil for skin care is still an insider-secret among beauty gurus. Glowing skin starts with staying moisturized. Castor oil is packed with ricinoleic acid for ultra-hydration, and it’s also a fantastic carrier oil for essential oils. Using caster oil to craft your own massage oil allows you to get all the hydration you need for radiant skin plus added aromatherapy benefits. Get glowing head-to-toe with all the info you need to start using castor oil for massage. Plus, we’ve included 3 amazing DIY massage oil recipes for scalp, body and feet that will give your beauty routine a self-care upgrade. Castor oil is the fatty natural oil extracted from the seed of the Ricinus communis plant, commonly called the castor oil plant. The castor oil plant is native to Ethiopia where the climate is naturally warm and the soil is moist and nutrient rich. While the castor oil plant is now grown throughout the world, today the majority of castor oil production and cultivation takes place in India. The type of castor oil most people are familiar with is unrefined castor oil. Unrefined castor oil is made using the cold-pressed method which involves very slowly applying an immense amount of pressure. Other types of castor oil include black castor oil and industrial castor oil. Industrial castor oil is the least natural of all and is made using chemical solvents to extract the oil. Black castor oil involves a bit more work to produce than unrefined castor oil because the seeds are first roasted and boiled before being pressed. The ashes from the roasting are then added back into the oil to produce black castor oil. Both black castor oil and unrefined castor oil are natural products and can be used for a variety of uses, industrial castor oil is not meant for personal use. Black castor oil is best suited for restoring pH balance to hair that is very dry and coarse. Unrefined castor oil, on the other hand, is a common carrier oil for essential oils that has multiple beauty benefits for your skin, scalp and face. Using castor oil on your skin and hair is generally considered safe, but it’s important to be careful with castor oil during your period or while pregnant. Pregnant and menstruating women can still use it on their hair and skin, but should NOT use castor oil on their abdomen without express permission from their doctor. Despite old-timey tales of castor oil used as medicine, DO NOT ingest castor oil. Castor oil can have a powerful laxative effect. This can be especially harmful for people with digestive conditions and pregnant women as castor oil can induce labor. It also reportedly tastes disgusting, so save yourself the trouble. Packed with nourishing fatty acids: Castor oil is made up of mostly ricinoleic acid (RA) which is a fatty acid triglyceride that helps moisturize and nourish the skin. Nearly all of the other benefits of castor oil are related to the high RA fatty acid content. Skin conditioning: Castor oil is an occlusive emollient and also humectant. This means it delivers moisture, attracts and traps water from the air, and helps skin retain that moisture. The deep moisturizing effects of castor oil come from RA, of course. Being occlusive and emollient means that castor oil adds to your skin’s natural barrier and also creates a light film on the top of skin. Adding to your skin’s natural barrier helps prevent water loss through your skin so you stay moisturized. Who doesn’t want a massage that leaves their skin glowing and conditioned? Soothing for skin: The anti-inflammatory properties of RA make castor oil a great natural option for soothing minor skin irritations and helping sore spots feel better. One of the key reasons to use castor oil for massage is to make use of its soothing properties. Cleansing: Castor oil naturally helps reduce surface bacteria on your skin. Itchy dry scalps especially can benefit from cutting down on bacteria. A scalp massage with castor oil is not only relaxing, but also keeps your scalp fresh. Carrier oil for essential oils: The mild aroma of castor oil is a good base for adding essential oils for fragrance. 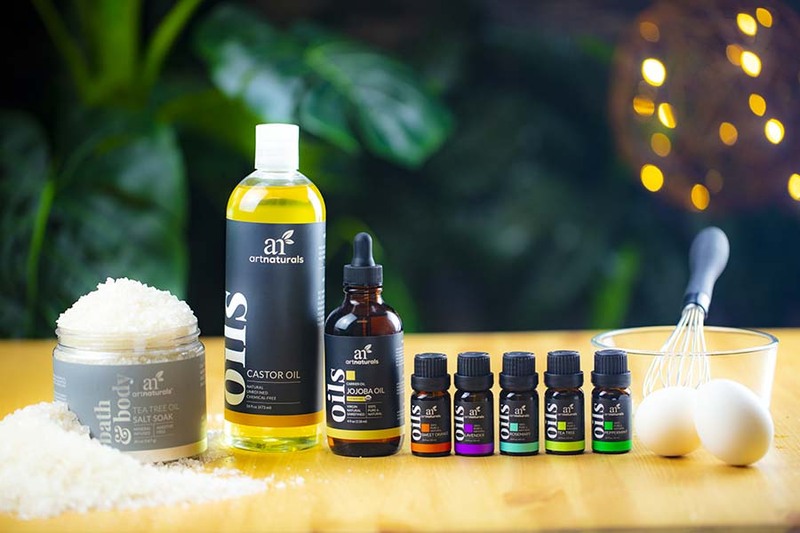 Of course it’s possible to mix essential oils with any lotion or cream for added beauty benefits, but why use such amazing natural ingredients and not go all the way? Castor oil is a natural carrier oil that brings its own nourishing benefits to your skin care routine. A hydrating castor oil scalp massage that doubles as a deep conditioning protein mask? Yes, please. Packed with ricinoleic fatty acids and protein, this castor oil scalp massage soothes the skin and improves the look and feel of your hair. Moisturizing, soothing and antibacterial, castor oil is a go-to choice for itchy, flaky scalps. A dash of cleansing tea tree oil boosts the refreshing power of this scalp massage recipe. Known for its antifungal activity, tea tree oil is often used as a natural line of defense against developing dandruff. * For long hair or extra thick hair, doubling all ingredients is recommended. Calming essential oils and soothing castor oil go together perfectly in this restorative DIY massage oil. We like this castor oil massage for releasing tense shoulders after a long day at the office, but you can use it on pretty much any sore spot (except in some specific cases, your abdomen— please see safety section above). For our calming castor oil massage, we chose one of our favorite combos of relaxing essential oils: Lavender, rosemary, and sweet orange. You can also use a premade essential oil blend or experiment and come up with your own. We specifically chose lavender for its superstar soothing properties and other many benefits. Rosemary compliments lavender’s woodsy herbaceous notes and is used in aromatherapy to renew mental energy. Sweet orange adds an uplifting sweet and fruity citrus note for positive chill vibes. This castor oil massage is all about taking care of tired toes while keeping your feet healthy and looking good. Starting with a salt soak is generally good whenever you want to soften and restore tired feet. Using a tea tree salt soak helps keep fungus at bay so it’s really important for general foot upkeep— especially after the gym. RA rich castor oil can help reduce puffiness from inflammation and help tired feet feel renewed. The cooling sensation of refreshing peppermint oil adds to the overall soothing vibe making overworked, hot, sweaty feel as good as new. Step 1: Add castor oil and essential oils to bottle. Cap tightly and shake well to mix. Step 2: Fill your tub or foot spa with water as hot as is comfortable for you. Add tea tree salt and swish around to mix. Step 3: Soak feet for 15-20 minutes.